There have probably been more dulcimer players and makers in East Anglia than in any other area of England. In East Anglia it was just called a dulcimer, not a hammered dulcimer as it is known in America in order to distinguish it from the hourglass shaped Appalachian dulcimer. Interest in the dulcimer was at its peak in East Anglia from around 1850 to 1930. The demand for instruments provided work for both skilled instrument makers and jobbing carpenters and also encouraged home made creations. In East Anglia the old players used cane beaters, typically wound with wool. 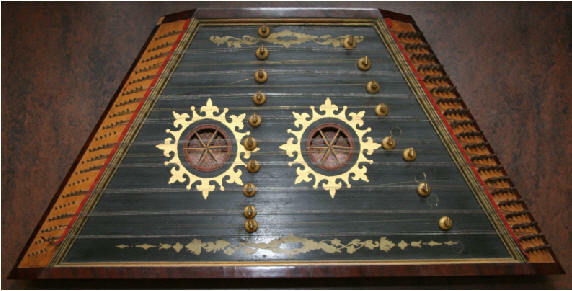 Most instruments from the region were highly decorated and had an integral hinged stand to enable them to be played on a table. The other distinguishing feature of the East Anglian dulcimer is that the bridges are individual not continuous as in other traditions. 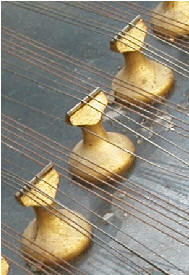 These, often called ‘chessman’ bridges, allowed for a more chromatic tuning as some could be moved to the left or right. 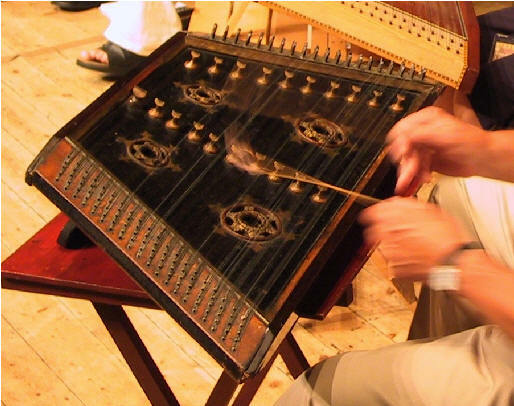 For centuries a form of struck psaltery or dulcimer has been played in most parts of the world. In England the hot bed for dulcimer playing was London and Birmingham (where the instruments were often played with plectrums) and of course East Anglia. This website is based on research carried out by John & Katie Howson, between 1978 and the present day. This research is ongoing, so we would be pleased to hear from anyone who has any information about East Anglian dulcimers, players or makers from the past.